Udupi, Jan 26, 2018: The 69th Republic Day was celebrated at Udupi with gaiety on January 26, Friday. 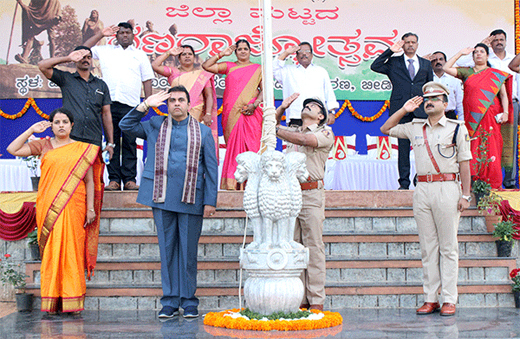 Udupi District in-charge Minister Pramod Madhwaraj unfurled the national flag at the district level celebrations held at the Mahatma Gandhi grounds at Beedinagudde. Speaking after inspecting the parade, the minister said the government has approved setting up of six Karnataka Public Schools for Udupi district. The Minister also highlighted the grants sanctioned under various schemes to Udupi district by the state government. The government has also approved a Rs 5 crore budget estimate for the first and second phase of the Malpe Fisheries Port Project, Madhwaraj informed. Deputy Commissioner Priyanka Mary Francis, SP Lakshman Nimbarigi, Additional DC Anuradha, ZP CEO Shivananda Kapashi, ZP Chief Dinaker Babu, CMC Chief Meenakshi Madhava Bannanje TP Chief Nalini Pradeep Rao and others were present.